(VOVWORLD) - The 12th Party Central Committee successfully concluded its 8th session, said Deputy Chief of the Party Central Committee Office Le Quang Vinh on Saturday at a press conference on the outcomes of the meeting. The Party Central Committee agreed to issue a new Resolution on the Strategy on the Sustainable Development of Vietnam’s Marine Economy until 2030 and Vision to 2045. The Committee adopted the conclusion on the socio-economic situation and the state budget in 2018 and the plan on socio-economic development and state budget projection for 2019. 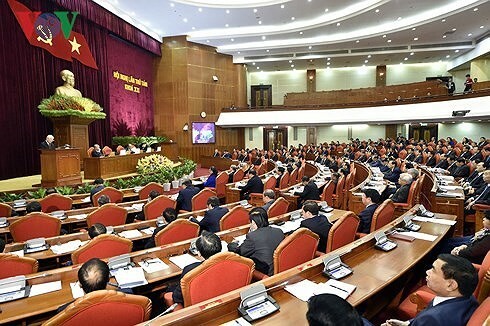 Participants also reached a consensus to nominate General Secretary Nguyen Phu Trong for the National Assembly to elect to the position of the President of the state in the legislature's upcoming 6th session. During the plenum, the Committee decided on the issue of the provisions on the responsibility of party members and officials - first of all members of the Political Bureau, the Secretariat and the Central Committee - to set example. It also decided to establish sub-committees to prepare for the 13th Party Congress, and elected two additional members to the Inspection Commission of the 12th Party Central Committee.